The Dual Focus Monocular Telescope is designed for you. It provides a bright and clear range of view up to 1000 yards away and it is also has a durable and rugged armor to withstand the toughest weather conditions. Are you looking for the clearest view from a monocular, along with durability? Are you interested in getting greater magnification with a bright and clear field of view? The Dual Focus Monocular Telescope is designed for you. It provides a bright and clear range of view up to 1000 yards away and it is also has a durable and rugged armor to withstand the toughest weather conditions. It is good for birds watching, wildlife hunting, camping, sporting events, traveling, hiking, sightseeing and etc. • Multicoated optics guarantee superior light transmission and brightness. • Dual focus capability (front and back adjustable zoom). 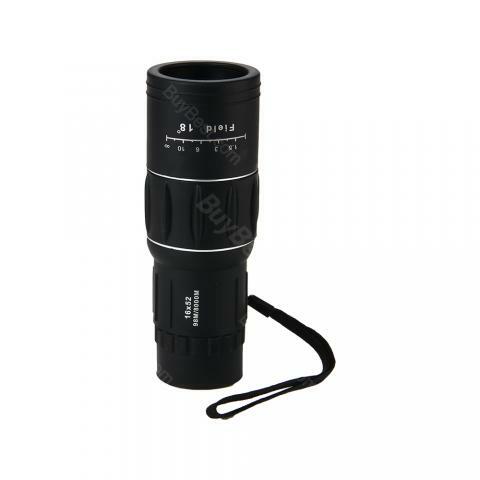 • Offers a 16x magnification and a 52mm objective diameter. Field of view: 98m/8000m. • Rubber Armored for Rugged Field Use.Monocular Size: 145 x 52 x 40 mm. • Good for sporting events, concerts, bird watching, camping, fishing, golf, scope and traveling. • Quick link：2 In 1 Phone Lens. Bravo product, worth the price. I can't buy the quality telescope with less than ten dollars. Can't believe I can buy such a great telescope with so low price. The site's salesmen are very responsible, helping me solve the custom problems and it arrived safely and sound. The lanyard of monocular telescope is practical; I use this device for climbing, fishing. I don't think the telescope can see clearly 1000 yards away. But worth the price. It's not a professional monocular telescope, a sound choice for kids to learn telescope. Not expensive. A great telescope for my golf sports. A must-have. I bought the monocular telescope for my weekend mountain climbing. Great experience. Can see clearly far away. Arrived in two weeks and it got packed without any blemish. The customer service solved a few of questions happily. Trustful telescope seller. Vote for you!